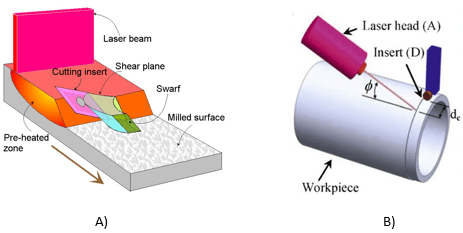 Thermally Assisted Machining (TAM) working principle for high speed machining: a) milling, and b) turning. Machining of many aero space components is difficult due to their thermo-mechanical properties. For example, machining of titanium alloys is highly sluggish and slow in the order of eight to ten times compared with aluminum machining. The main reasons are low thermal conductivity which one-sixth of the steel and one-thirtieth of aluminum, and high chemical reactivity at elevated temperatures. Due to this inherent material property the heat generated in the machining process can not be conducted away rapidly by the workpiece and is mostly concentrated in the cutting inserts causing insert temperature to rise sharply. High heat affects tool stability and more importantly results in welding between cutting inserts and swarf, commonly known as built up edge (BUE). These combined adverse effects prevent high speed machining for aerospace alloys. A high buy-to-fly ratio (>20) requires substantial material removal in the machining process. These result in high machining cost which is roughly 50% of the component cost for titanium alloys. Current challenges are to reduce the machining cost and to develop high speed machining process. 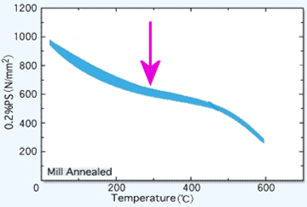 Strength reduction as a function of temperature for Ti6Al4V alloy. Localised surface preheating by a suitable laser beam can substantially reduce the strength of the material and cutting force in the milling and turning process. A laser beam appropriately positioned ahead of the cutting tool is the key to achieve high speed machining. The laser beam softens the metal up to the depth of cut without affecting the bulk of the workpiece and allows the cutting insert to shear swarf and remove metal at more than 50% less cutting forces. The process does not require coolant rather high pressure chilled air is directed between the insert and swarf to keep the insert cool and prevent the formation of BUE. Our thermally assisted machining (TAM) facilities are equipped with two 4 kW fibre delivery diode laser and 3 axis Bridgeport milling and Mori Seiki turning machines. There are several laser optic heads to produce straight line and circular laser beams. Straight line beam is used for milling process and circular beam for turning process. Multi-physics thermo-mechanical modelling capability allows to predict thermal boundary both in the workpiece and cutting tool. 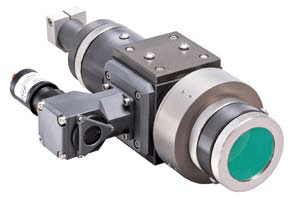 Optical head with closed loop pyrometer.